A team of Australian palaeontologists have published a paper on three separate dinosaur tracks that prove the existence of large carnivores in the Cretaceous polar forests. The team led by Anthony J Martin (senior lecturer in Environmental Studies at Emory University, Victoria), are presenting their findings at the Society of Vertebrate Palaeontology meeting in Austin, Texas. These three-toed prints are the first tracks belonging to theropods to have been discovered in Australia. The trackways were made by unknown large carnivores as they made their way across a muddy floodplain approximately 115 million years ago (Aptian faunal stage – mid Cretaceous). The team of scientists composed of researchers from both Emory University and Monash University, accompanied by palaeontologists from the nearby Museum of Victoria found the trackways near the coastal town of Inverloch, an area that has provided a number of Dinosaur finds. The first two tracks were found by Anthony Martin in February 2006, with a third trackway identified by a postgraduate student on another visit to the site 12 months later. 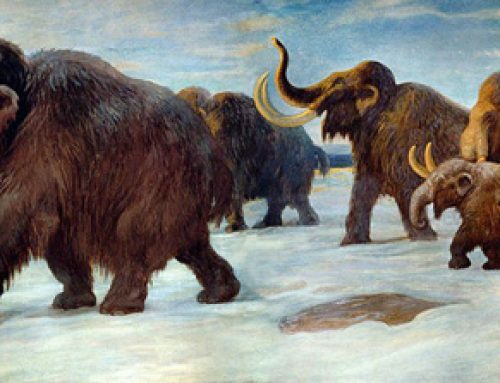 As yet the scientists have been unable to determine whether these meat-eaters were travelling together in what would have been some sort of pack. They are confident of finding more trackways in the area to help them shed more light on the type of animals that might have made them. The tracks are especially significant for showing that large dinosaurs were living in a polar environment during the Cretaceous Period, when Australia was still joined to Antarctica and the area was subjected to freezing conditions and total darkness for part of the year. Whether these large carnivores were permanent residents of the polar forest region is unknown. Perhaps they followed migrating herds of Muttaburrasaurus (an Iguanodontid) that moved into the area to take advantage of the 24-hours of daylight in the short summer. In the picture the scale bar is 10 cm long and is placed at the heel of the foot, two digits can be clearly seen with a third, slightly less obvious digit to the right. The prints are up to 35 cm long and scientists have speculated as to what sort of meat-eater could have made the tracks. One of the candidates put forward is Allosaurus astragalus (Dwarf Allosaur), an animal estimated at being up to 6 metres long and a smaller descendant of the fearsome Allosaurs of the Jurassic. Allosaurus astragalus is known from a few fragments of ankle bone found in 1979, although there is still debate whether enough evidence has been gathered to state with any conviction the existence of this animal. The name still carries “Nomen dubium” status. If A. astragalus was around 115 million years ago in this region it would have been regarded as a “living fossil” as the Allosaur group was very much in decline with the mantle of top predators being taken by the Tyrannosaurs. The finds from Victoria have helped palaeontologists document the remarkable fauna and flora of the extreme Mesozoic environment. During this part of the Cretaceous the region was inside the Antarctic circle and although the area was not covered with ice caps, its climate was still very cold with winters of total darkness and short summers when the sun did not set below the horizon. This environment was the subject of one episode of the “Walking with Dinosaurs” series – “Spirits of the Silent Forest”, the Dwarf Allosaur seen in that programme inspired the sculptors at Bullyland to produce an Allosaur based on colouration of the Australian dwarf species, it is a remarkable model. The habitat was indeed very harsh and the prehistoric animals that inhabited the polar forests of lichen covered conifers and ferns had to adapt to these conditions. Perhaps the limited amount of food ensured that the meat-eaters in the area remained relatively small compared to the cousins further north.